Are dry shampoo sprays bad for you? Good question. I cannot prove that all dry shampoo products are unhealthy. However, after our own personal, scary experience with dry shampoo aerosols, I am more than skeptical about the safety of these chemical-laden sprays. My daughter started using dry shampoo at 14, about the same time she started high school. The goal is to reduce the look of greasiness and make the hair feel cleaner. Not long after her freshman year began, she became frustrated on a daily basis about the condition of her hair. It would become greasy the same day that she shampooed it! We attributed this to teen hormones but knew something else was up. She plays volleyball and eats healthy foods. We investigated the quality of the water in the home. We tried tea-tree based shampoos, shampoos for gentle hair, no conditioner, different conditioners and took a break from shampooing all together for a few days, then washed with a sulfate-free shampoo made especially for sensitive skin. 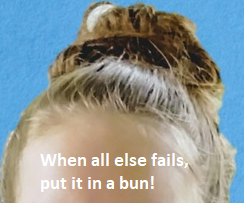 Her school pictures were shocking – it looked like her head was dipped in oil, and she used no styling products back then! The moment I saw sores on her head I woke up! I was shocked when I folded over her once beautiful blonde hair to take a closer look. She had large red patches on her scalp and areas around her head that looked like acne. I stood there and pictured her blasting her roots and filling the air with liquified gas propellant, laced with synthetic fragrance and more questionable ingredients. The first few listed may put you on alert: butane, isobutane and maybe \propane. If you’re lucky, you might find a brand that contains a touch of oat milk, star anise vanilla or other “natural” add-in. Dry Eyes: Her eyes were painfully dry, so much that her vision was affected. She asked me to get her eye drops or an appointment with the optometrist. I made the connection to the dry shampoos. Once we stopped her dry eyes went away. 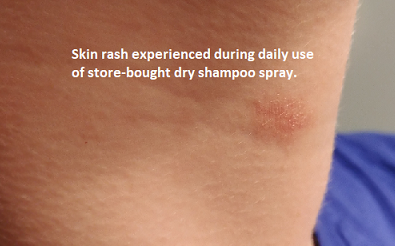 Skin Rashes: Sprays disperse in all directions and after a time, she discovered scaly patches on her neck too, not just her scalp. Air Pollution: With little air circulation in her bedroom and the bathroom, my daughter was creating a chamber of poison filled with clouds of synthetic hair spray, perfume and dry shampoo. I still feel the guilt of not catching this sooner – I should have been more perceptive. Asthma Trigger: At six years old, my girl was diagnosed with allergies to cat dander and dust mites. As she has grown older, her reaction to these irritants has been less harsh. During the span of time we now call the “Dry Shampoo Era”, she talked a lot about maybe needing her inhaler. Hair Damage: Dry shampoos are also popular because they give hair grip – perfect for keeping special hairstyles in place. The same ingredients that soak up the grease and provide some tact to the hair shaft are the same ingredients that will coat the scalp. The residue is thought to damage hair and potentially cause hair loss over time. Beware of dry shampoo packaging designs. Colors and graphics that make you feel like you’re in a spa or frolicking on an organic farm do not prove that the stuff inside is good for you. You can make your own dry shampoo. It will absorb oil and smell delightfully fresh. It’s a powder that is easy to shake on and blend in. 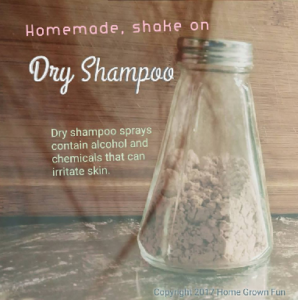 What are the benefits of homemade, dry shampoo powder? We’ve experimented with other combinations including tumeric (potentially stains clothes and skin). This 3 ingredient recipe is just right. Mix well, apply lightly – use a makeup brush, salt shaker with large holes or plastic spice shaker container). Apply only to areas that need it and gently brush through. Please let me know what you think! We know not every natural remedy works for everyone, but if you give this a try we would love to know your results.